Waxing your Colltex Skins for the perfect glide! Colltex is always getting feedback from their top athletes. They all give them valuable suggestions for the optimization of their products. 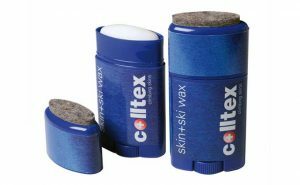 In order to prevent clumping and icing of your skins – especially in extreme cold – Colltex recommends to regularly wax your skins. Colltex developed wax that is specific to their product and it has been proven to noticeably improve the gliding properties. Check out the attached video demonstrating how to wax your Colltex Skins. TIP: When walking, be sure to glide and NOT lift the ski. This reduces the risk of stud formation and icing. Extreme cold, frozen skins, and cold skis can affect the adhesive properties. Therefore check the adhesive layer regularly and, if necessary, re-coat the skins.